During the downtown building boom of the mid-20th century, views of the Capitol became obscured on three sides. The natural characteristics of the historic French Lick that attracted wildlife, trappers and Native Americans preserved the remaining view because the soft ground to the north between the Capitol and the Cumberland River would not support the construction of skyscrapers. The concept for a park situated north of the Capitol first originated in 1985. This open space was selected as the setting for the Bicentennial Capitol Mall State Park shortly thereafter. The park cost nearly $30 million in federal and state matching funds. Many individual donors also made financial contributions to the project. Their names are engraved in the 17,000 decorative pavers that comprise the Path of Volunteers. Designed by Tuck Hinton Architects, this urban space was designated by the American Planning Association in 2011 as one of the top 10 public spaces in the country. It provides a stunning view of the Tennessee State Capitol building, which sits atop a hill overlooking the park. As an outdoor museum, the mall features a series of design elements that highlight the natural and cultural history of Tennessee. Tennessee Map Plaza has a 200-foot-wide granite map of the Volunteer State. One of the largest and most accurate depictions of a geographical region, it includes every city, county, river, highway and railroad in the state. There are eight smaller granite maps positioned beneath the larger atlas. They illustrate additional detailed information about the state’s geology, early inhabitants, musical heritage and recreational opportunities. The Rivers of Tennessee Fountains is a collection of 31 geyser-like spray fountains commemorating the state’s major lakes, rivers and tributaries. Inscriptions provide details about these waterways. A large trough represents the Mississippi River. On hot days, visitors cool off by splashing in the water jets. Located in the middle of the park is the 2,000-seat Tennessee Amphitheater, which features terraced lawns and a dramatic view of the State Capitol. It is patterned after the Greek amphitheater at Epidaurus. It is the setting for outdoor concerts and other theatrical productions. The Court of Three Stars has a large red, white and blue circle with three stars similar to the center of the Tennessee state flag. The three stars represent the food, music, cultural and geographical differences of the “Great Divisions” of the Volunteer State. The divisions are the mountains of east Tennessee, the rolling hills of middle Tennessee and the delta of western Tennessee. Surrounding the Court of Three Stars is the 95-bell Carillon. The bells are housed in 50 Greek-style columns. They represent the state’s 95 counties. The carillon plays a portion of the Tennessee Waltz each quarter hour. At the top of the hour, the bells play the entire song. A 96th bell housed in the state house joins in to audibly represent the government’s responsiveness to the people. The Walkway of the Counties is a path that includes a marker for each of the state’s counties. Underneath their respective marker, each county has interred a time capsule scheduled to be opened on Statehood Day 2096. The path is also designed to highlight the topographical differences within Tennessee. Planters along the pathway contain species indigenous to the various regions of the state. Located on the west side of the Mall, the 1,400-foot-long Pathway of History is a wall engraved with significant events in the history of the state from its founding until the bicentennial. Each decade is memorialized with a granite pylon. A symbolic break in the wall represents the division within the state and the nation during the Civil War. There are several memorials within the park. While a monument highlights the 1896 Centennial Exposition, McNairy Springs is a fountain that represents the founding of Tennessee. The monument sits on top of the original spring that was fed by the Old French Lick Creek. The Sulphur Springs Monument, comprised of three fountains flowing into a rock garden symbolizes the wetlands and wildlife of Tennessee. The centerpiece of the World War II Memorial is an 18,000-ton black granite globe. Suspended by a thin veneer of water, the globe is surrounded by pillars etched with images from the war and descriptions of their relevance to the state. There is a bench honoring each of the seven Tennessee recipients of the Medal of Honor. In addition to the annual Tennessee History Festival, the park hosts a number of special events throughout the year like the Nashville Food and Wine Festival. Held in the fall, the History Festival features costumed re-enactors who provide hands-on demonstrations and fact-filled narratives. The event provides a glimpse into the daily aspects of local life during the mid-19th century. The Nashville Symphony also hosts free public concerts on the Mall. Adjacent to the Bicentennial Mall, the Tennessee State Capitol was completed in 1859. The work of William Strickland who is entombed within its walls the Greek Revival-style building is one of the oldest working capitals in the nation. It features elegant chandeliers, frescoes and other works of art. In addition to the graves of President and Mrs. Polk, the grounds host various monuments and statues. Home to the Triple-A Nashville Sounds as of 2015, the 8,500-seat stadium features a distinctive guitar-shaped scoreboard that is capable of displaying a variety of graphics as well as in-game statistics. Located downtown, the park’s music and imagery are designed to connect the team with the city’s entertainment heritage. Enjoy a daytime stroll through the Mall before watching the future stars of tomorrow during an evening baseball game. Located on Gay Street just east of the Capitol is the Musicians Hall of Fame. The museum honors the talented singers and songwriters as well as studio musicians who toiled behind the scenes to help produce hit records. Exhibits chronicle the careers and contributions of these versatile and often unsung performers who created the unique sounds associated with Detroit, Muscle Shoals and Memphis. Dating from the 1800s, the Nashville Farmers’ Market is located on Rosa Parks Boulevard one block west of the Mall. Covering 16 acres, the Market House as well as the North and South Farm Sheds has a variety of vendor stalls, eateries and other merchants along with a weekend flea market and various special events. Open year-round, the farmers’ market is a wonderful place to grab a bite to eat or purchase fresh ingredients and refreshments for a picnic lunch at the Bicentennial Mall. Along with park-sponsored events, Bicentennial Mall is a popular setting for local and regional celebrations, which typically occur on weekends. If you want to avoid large crowds, the best time to visit the park is during the week. From April to November, free ranger-led park tours are available on Mondays and Wednesdays at 10 a.m., 1 p.m. and 3 p.m. The tours depart from the Visitor Center that is situated under the train trestle on the southern edge of the Mall. Lasting approximately one hour, the tour provides insights into the relationship between the park and the history of the Volunteer State. Maps for self-guided tours are available in the Visitor Center. Picnic tables and public restrooms are also located underneath the train trestle. Leashed dogs can romp on designated green areas. Finding parking near the Mall is difficult, especially on weekends and during festivals. Events may also necessitate street closures, which can lead to traffic jams. The ideal way to beat the traffic and avoid the hassle of trying to find a place to park is to ride the Old Town Trolley. In addition to convenient and comfortable transportation, the Nashville tour includes a narration that features insight into Music City’s most popular points of interest. 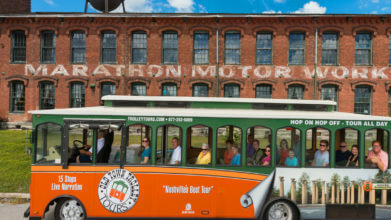 Hop off the replica vintage trolley, explore Music City at your own pace and then hop aboard the next one that comes along. With the largest fleet in the city, Old Town Trolley ensures that a conductor comes by each stop every few minutes.